'Does the Sun Come Out or do the Clouds Go Away?' Burnished and smoke-fired clay with various threads on brass hooks. Similar work £350-600. 'Tangled Threads 3' Dyed and warp-wrapped sisal, Burnished and smoke-fired clay Mixed yarns. Similar work £600-700. 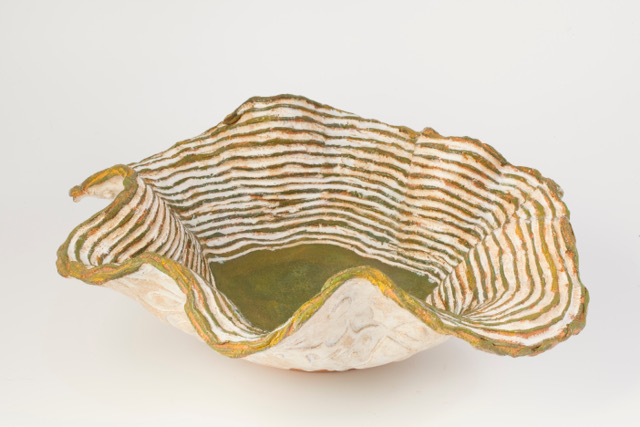 By combining low-fired, hand-built ceramics, pressed porcelain casts and colourful textile threads, Jane Burden produces highly crafted, reflective work that connects to themes of ancient landscape, social history and human emotion. Her most recent project, the catharticTangled Threads series, explores on a number of different levels the tensions between calm and chaos, order and confusion. Considered use of materials and techniques bring together beautifully hand-cut and burnished thread ‘cards’, which are individually stamped, smoke-fired and wrapped in dyed yarns. The careful arrangements of smoke tones and subtle coloured threads allow for powerful communication through a unique medium. She works from her studio in West Dorset where she is connected to land and sea; she was recently selected for the Dorset Makers group; won the Ilminster Open prize and had a permanent piece installed at Dorset County Hospital. A long standing member and trustee of Dorset Visual Arts, a full member of Dorset Craft Guild and an active member of Wessex Contemporary Artists, she exhibits regularly. 1973-74: Bath Academy of Art Foundation. 1974-77: Leeds Polytechnic 3D Design BA hons 2:1. 1977-85: Set up The Julian Workshop (textiles) in Sherborne, selected as Full Exhibiting Member of Dorset Craft Guild and exhibitor at The Contemporary Textile Gallery, Vigo Street London. 1997-2015: Art teacher and owner of ArtXtrA, an AQA accredited art school offering GCSE, A level and art workshops; National Gallery ‘Take One Picture’ training sessions. 2010: permanent installation of ‘Puck’s Girdle’ at Dorset County Hospital. Selected for Wesca membership; DA trustee. 2016 overall winner of Ilminster Open; selected for Making Dorset. 2017: joined DVA board of trustees. Exhibitions include: Kettles Yard Gallery; Wysing Arts; The Study Gallery, Poole; Sherborne House; Durleston Park; Walford Mill; Dorset County Museum; Wolfeton House.